I recently rebuilt the Legotron so it'd focus to infinity and it got me dreaming about building something else. And even though I'm not great at checking in at flickr these days, I still subscribe to the RSS of a couple of people who have work that I love. One of these is Benjamin Goss (flickr, website), a fellow I've been following for longer than I can remember. 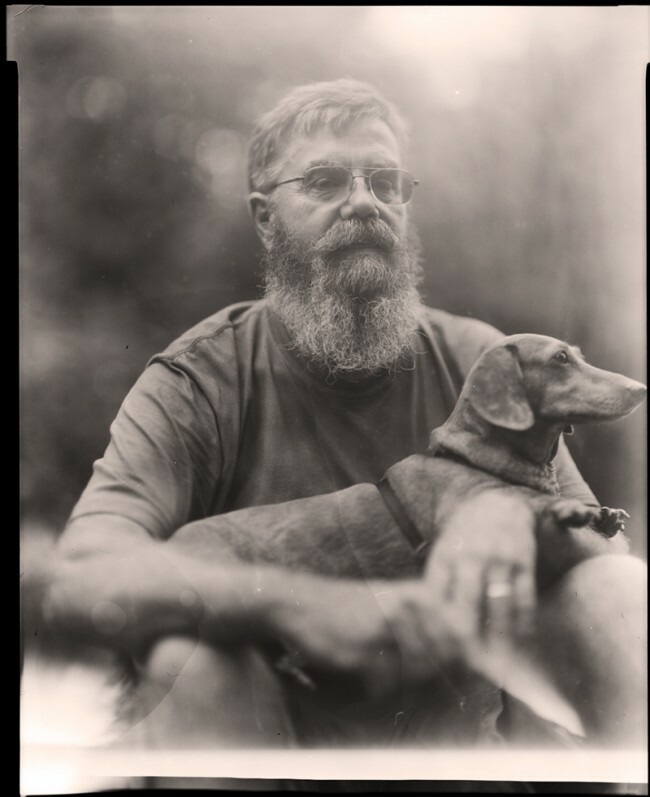 I can't even remember how I found it—I suspect a portrait group I was in or something like that—but I've always gotten into his ethereal work but I've had one of his images lodged in my head since I saw it in my google reader back in July. 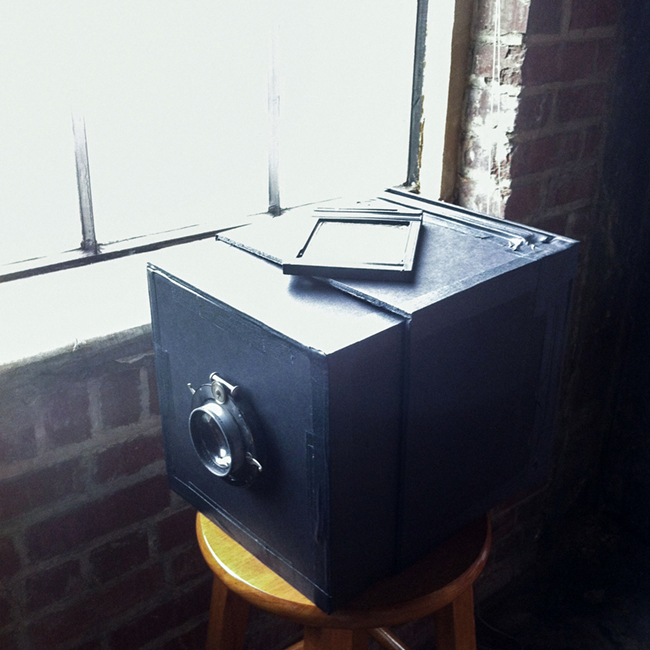 So long-story-short, I decided I'd build an 8x10 field camera. A nice one, out of wood or something. Maybe throw some metal in there. 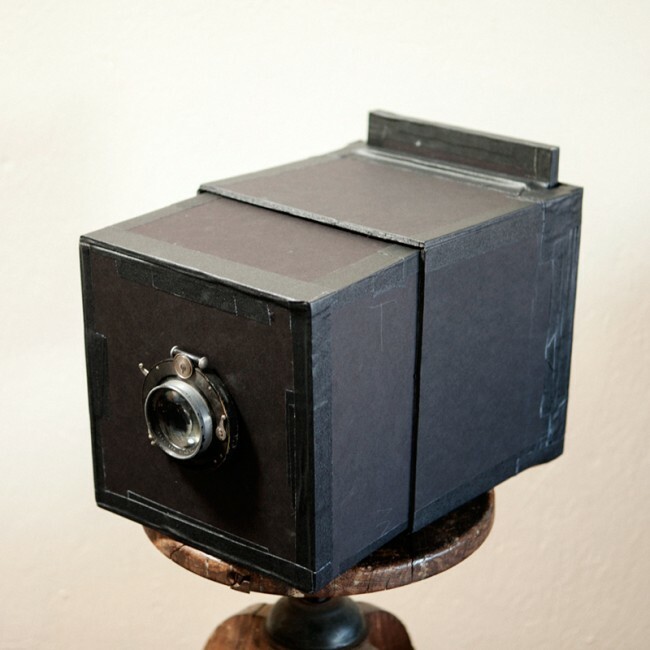 So I bought an 8x10 lens as step one and promptly realized one doesn't just walkintoMordor throw together a well-made, (really) large format camera, but I had this lens and I figured I should make sure it works before I built a camera around it. 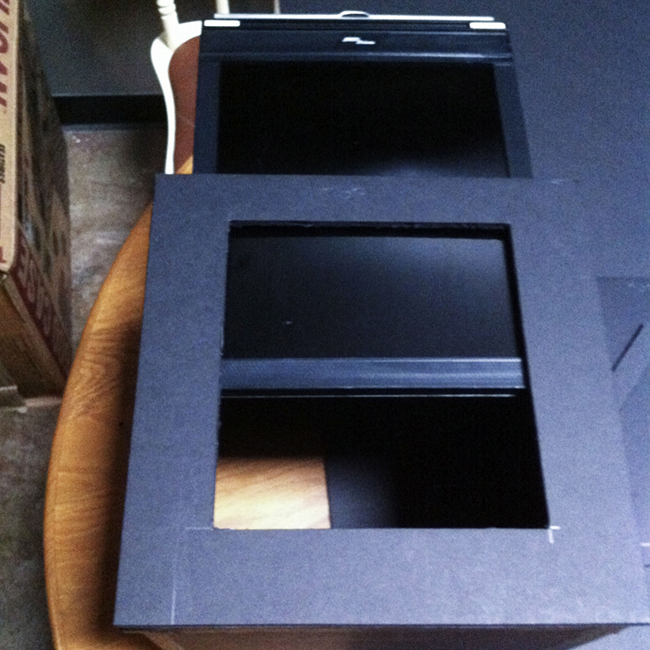 So, instead, I threw one together out of foam core, which was surprisingly easy and super cost effective. That's it up above, and below are some sample images from it, and then below that is tedious information on how to make an 8x10 for like 15 bucks, if you've got a lens* and some miscellaneous stuff laying around the house. Stephanie at the Cahaba River. I'm not sure if I mis-focused (very likely), or if my super-low-budget ground glass was out of register, which is totally possible (and a little bit goes a long way). 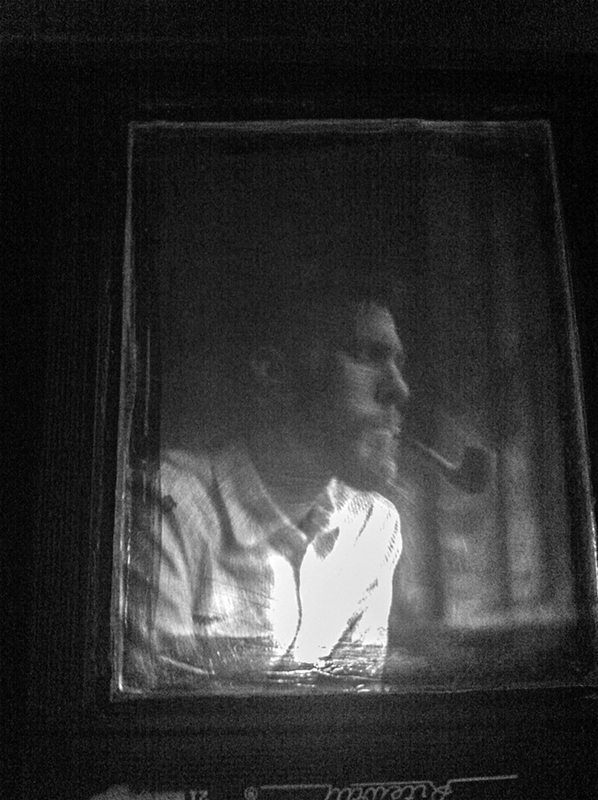 So since July I've been dreaming about this ghostly smoker guy (Benjamin Goss's image) and thinking long and hard about large(r) format and paper negatives and buying or building an 8x10. I'm still in the process of some of this, but this blog post is about my trip so far in quest of shooting 8x10. 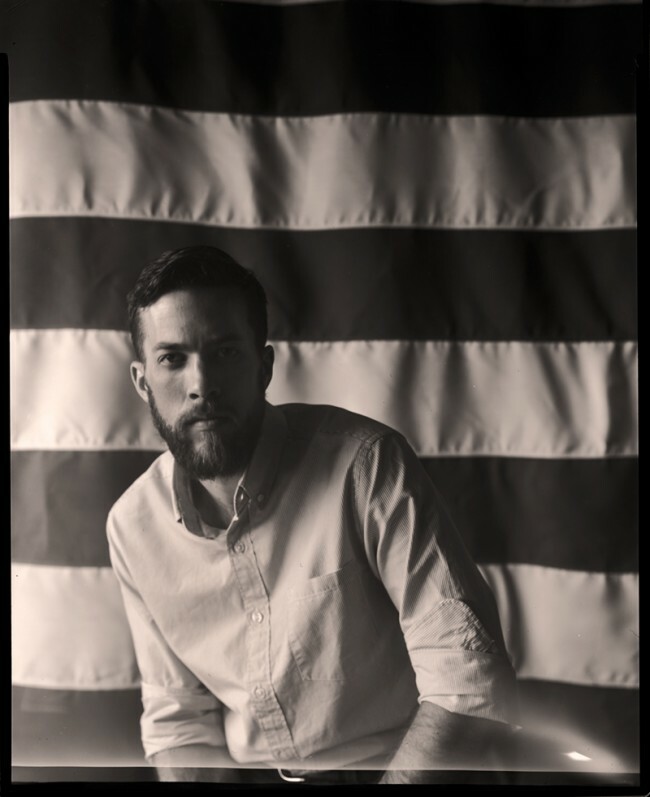 Back in 2010 I bought some 8x10 holders and film and shot a few frames on my buddy Jason's mostly-decorative, but perfect studio camera and have been meaning to get back to it since then. Haven't so much done that. After it came in I figured out, very quickly, how impatient I was to get to play with it, and last Thursday I woke up determined to make a quick and dirty camera to test the lens. 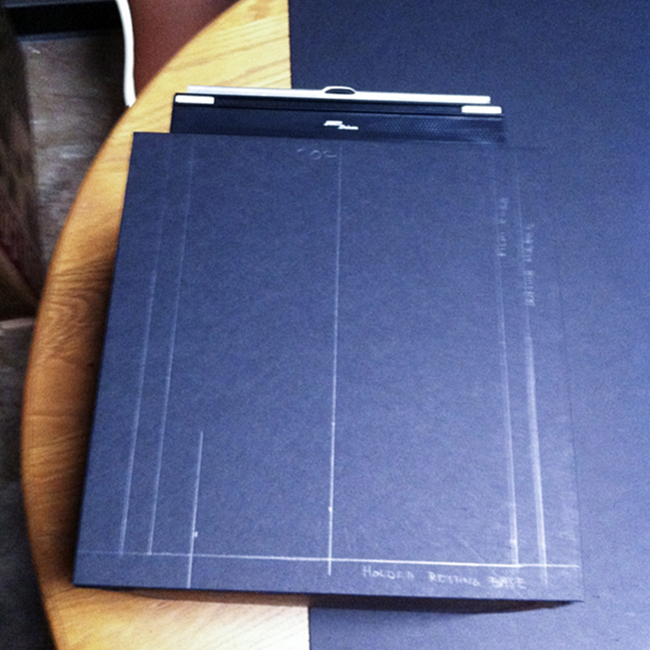 I sketched out some rough numbers at breakfast and went first thing to the art supply store to get some black foam core. I did the math and figured I needed between 4 and 5 square feet to create all the surfaces. I budgeted liberally and used scraps in some places instead of cutting full pieces (I'll explain why later), so I have leftovers still, but I'd rather have too much, right? -Gaff tape. Lots. Other tape is fine, but gaff is perfect and probably hanging around somewhere anyway. 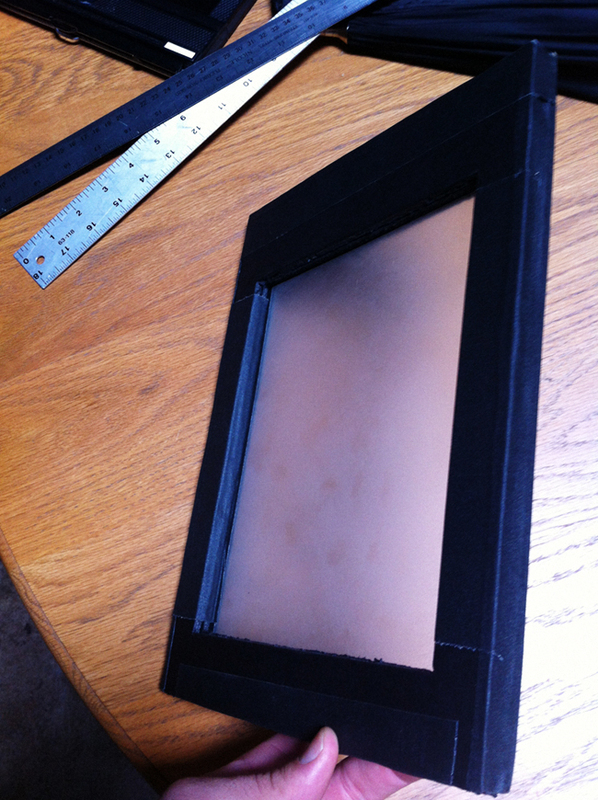 -Sandpaper for making the (admittedly super low budget) ground glass. 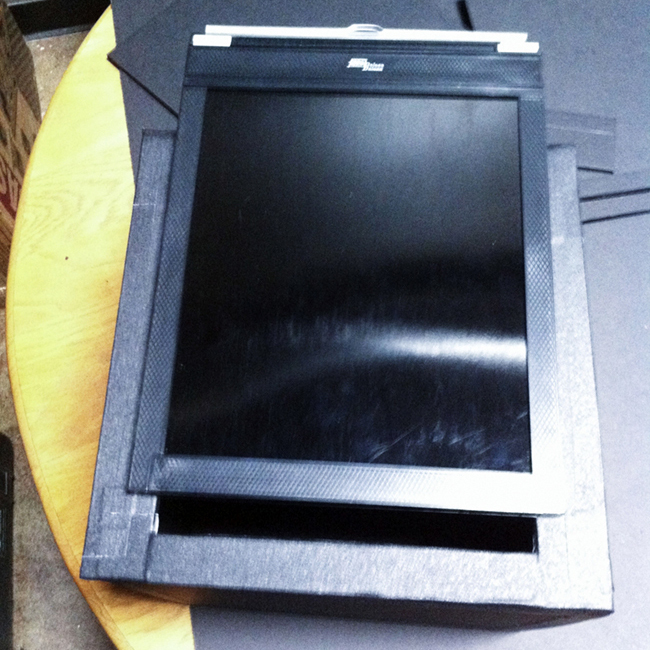 -I knew I'd need some buffer to help keep the film holder in place, so I made the larger box 11" x 11" (~280mm) (W x H) and 10" (254mm) deep. 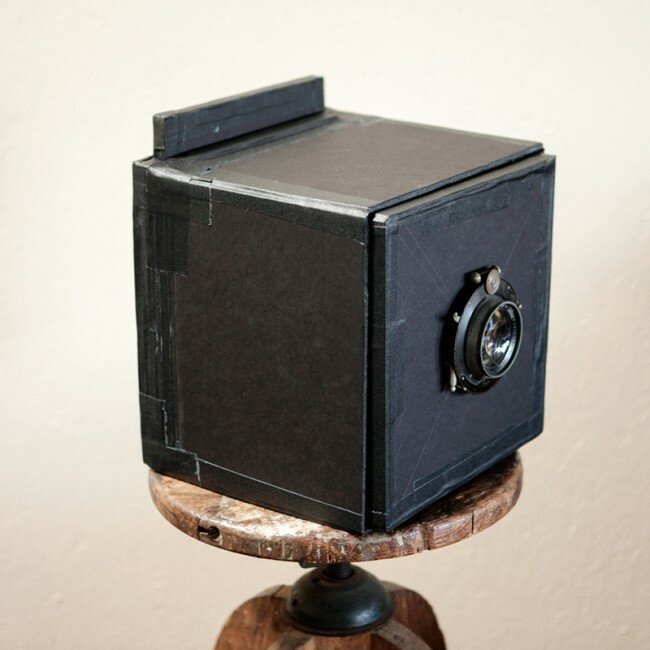 -The smaller box that holds the lens is just enough smaller to slip firmly inside the larger one. 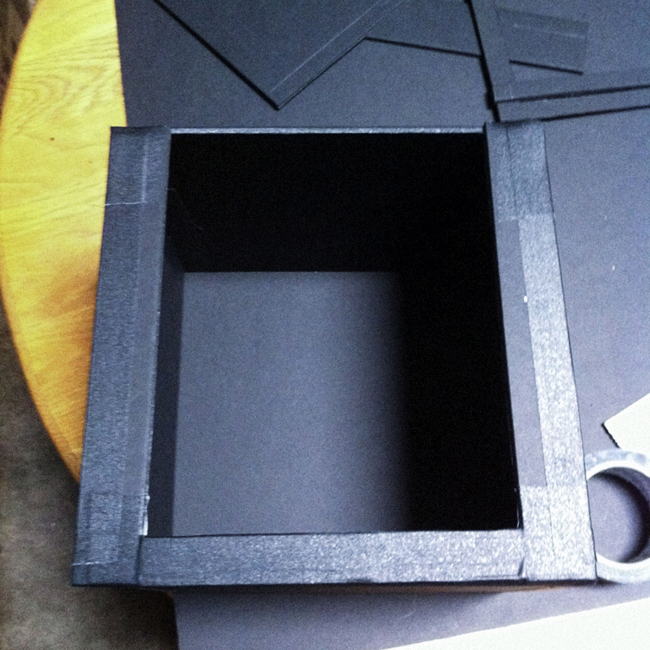 The foam is 3/16" thick, so accounting for two layers** of it, the smaller box is just under half an inch smaller. 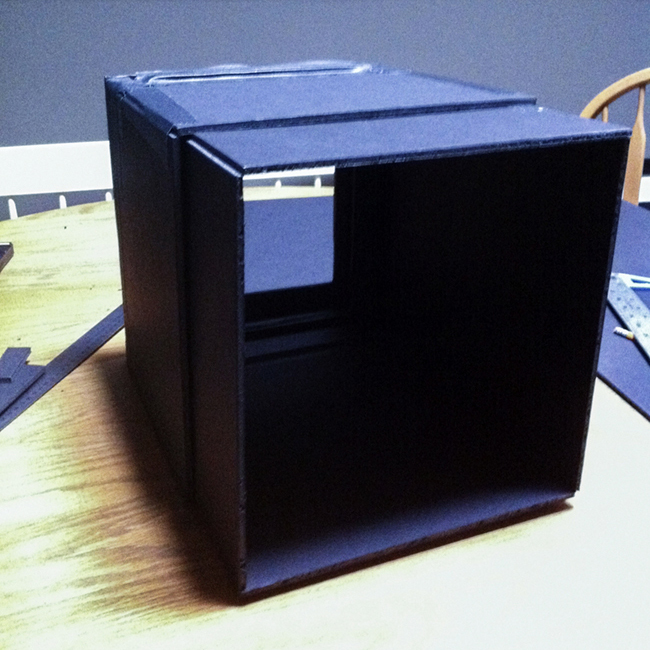 -Lensboard/front of camera ended up being basically 10 3/8" (~264mm) by 10 1/2" (~267mm). I did that one in 2 layers for extra support. 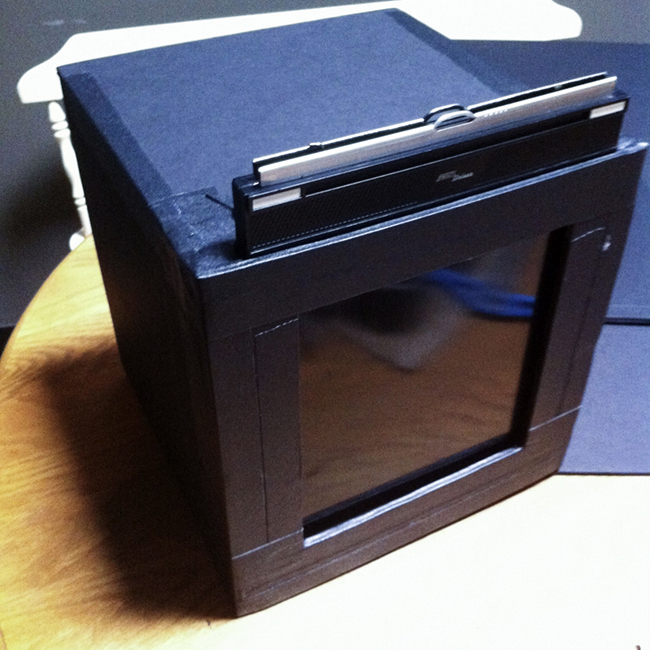 -Ground Glass holder measurements (outside) were basically the same as the cut film holder, and 3 foam core layers deep (so a little over half an inch). I'll mention the window cutout later. 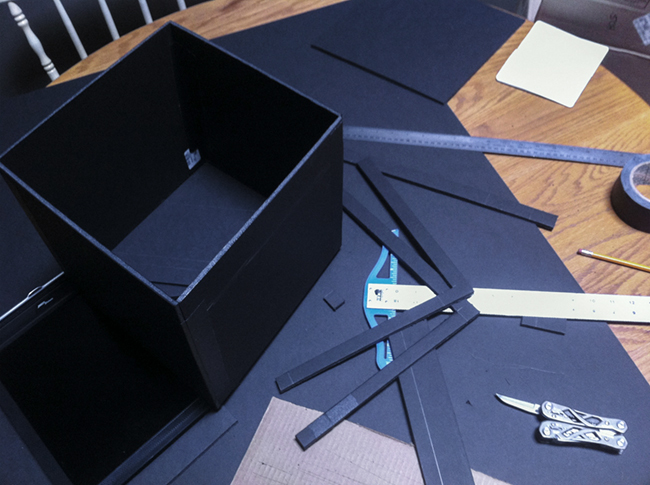 **Technically, I scored the larger box and folded it on the measurement on opposite corners, if that makes sense, so I actually gained some space if you measured the outside edges. But I did the same on the small box too, so it sorted washed. But I'm sure I tweaked some measurements on the fly. These are just roughly what I did. 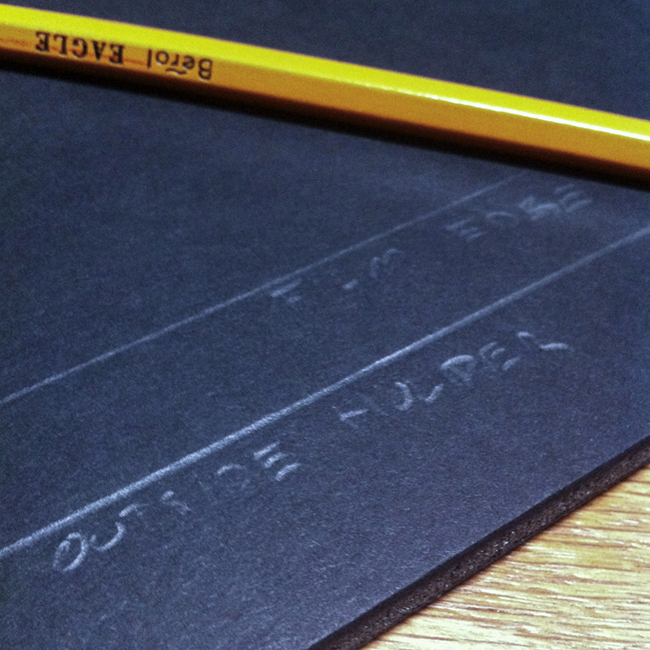 The above are measurements from the edge of the film holder to where the film plane starts. I used this distance to make a flange that would guide and hold the film holder / ground glass insert without cutting off any image. Those little L shaped things are part of extra spacing (ie an extra "ply") for the back of the camera. Before I started attaching the back parts, I tried to give the wobbly box some strength with a bit of angle insert things (both pretty small..one about 3/4" tall, and the other one laying flat inside the box). Not sure how much this did, but I was doing it by the seat of my pants, so whatever. Top view of the back of the camera. First layer of the back..The left to right measurement of the gap there is basically 8", as that's the width of the film hole on the film holder. Note that I left the top part with a gap in it (ie I made a U shape instead of a rectangle). That was not well planned as I had to try to compensate for that later (light leak!***). Film holder on top, for perspective. 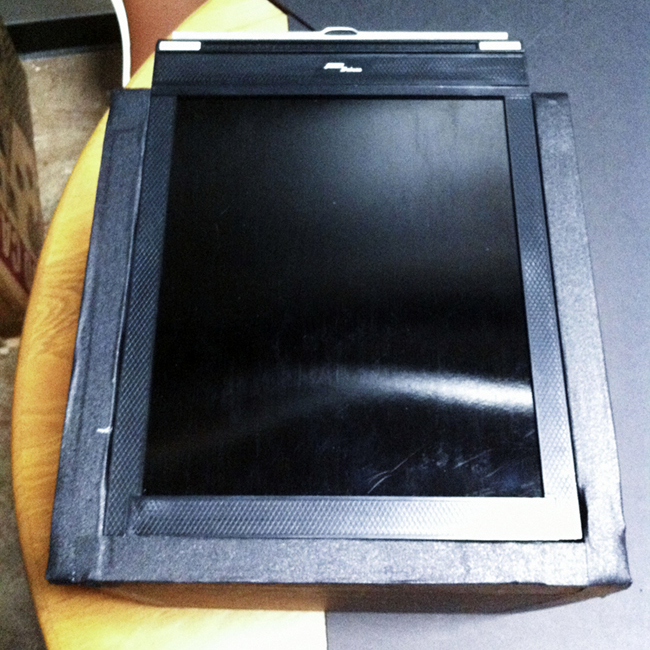 3 layers of of holder/ground glass slot taped on. 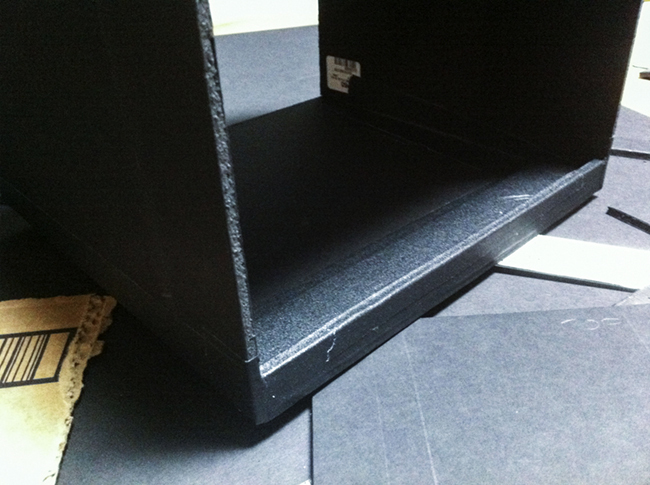 Perfect height of the holder is three layers of foam core. Score! Last (5th) layer of the back of camera. 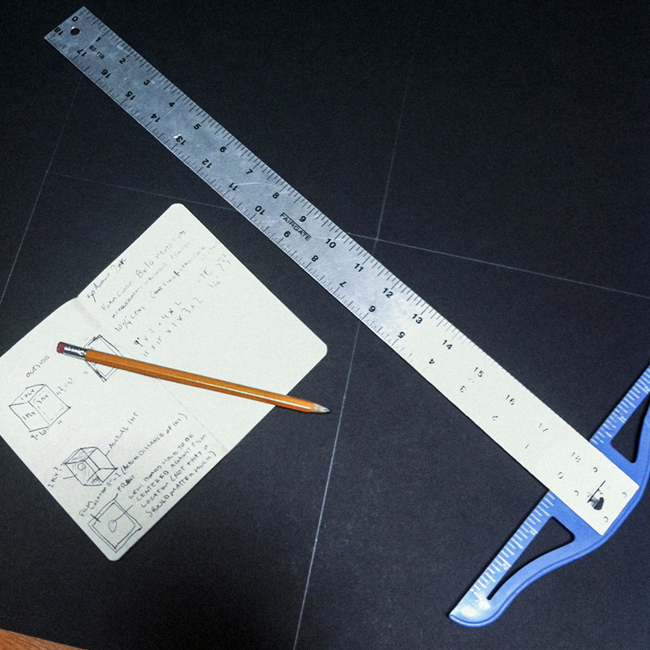 I used it earlier for measurements and as a cutting template. 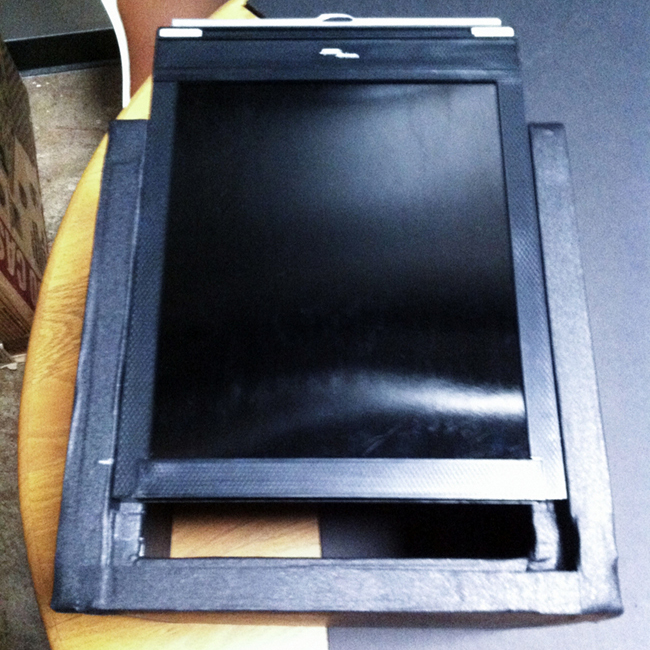 I cut out of the last panel a 7 1/4" by 8" (184mm x 203mm) hole for viewing the ground glass. Sure, that's not 100% viewing area, but who cares. 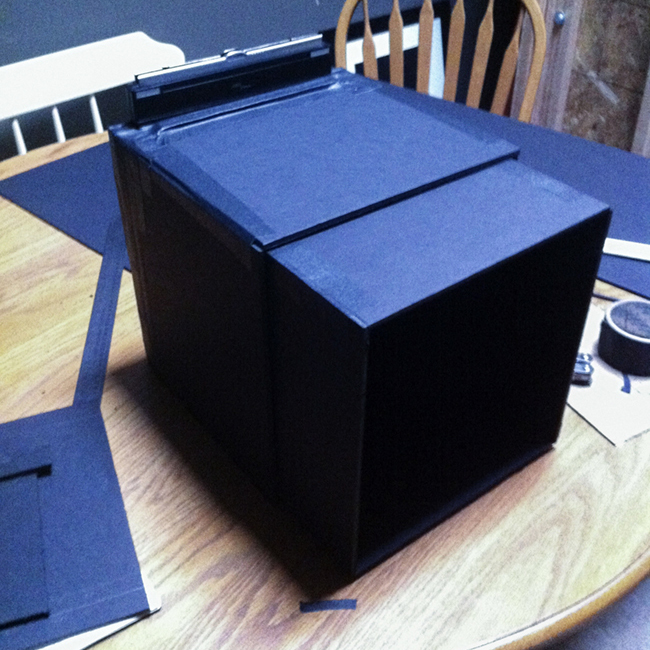 Built the smaller box and slipped it in to make sure it'd go. My lens hole is basically 3" (~76mm). 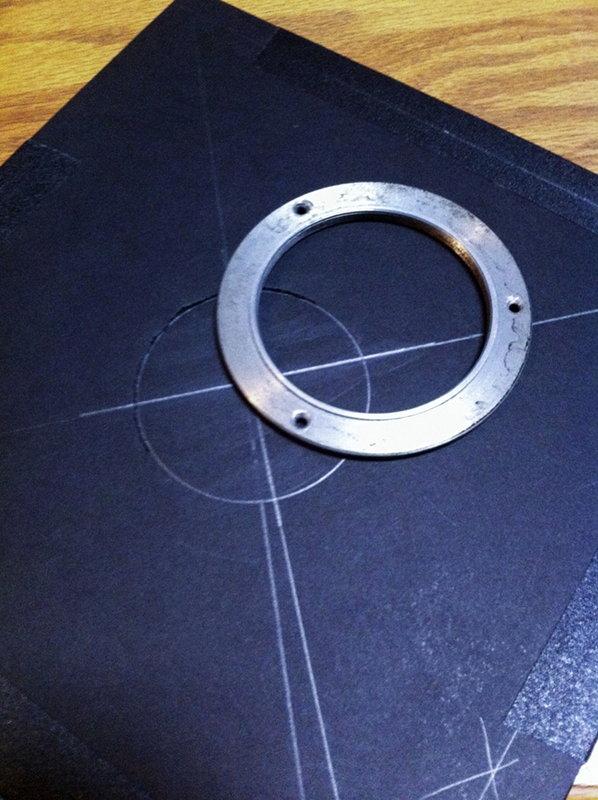 I just traced in the inside of the lens retainer flange. 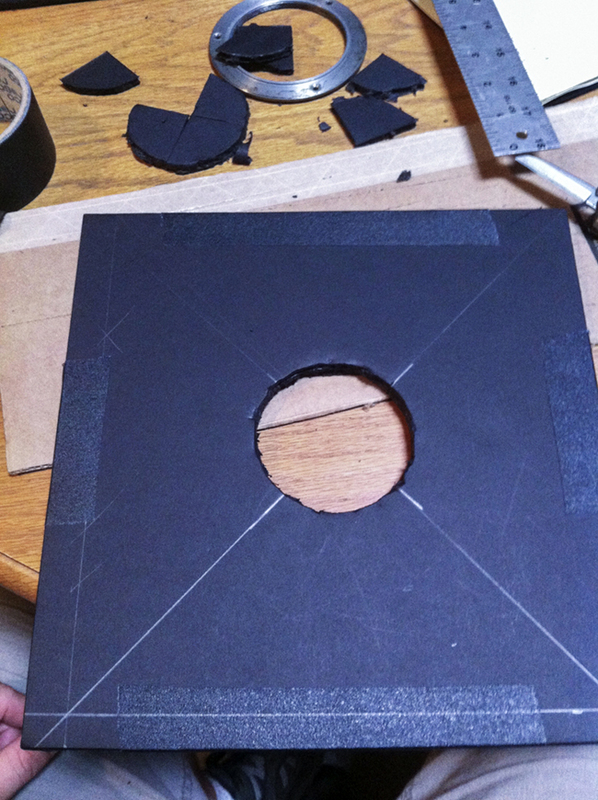 Sure, that'd be a bit small if this was a wood or metal lensboard, but I can fudge it with this material. I made the front panel 2 ply. That meant I couldn't screw on the retaining ring, but the hole was really tight, so I just threaded the lens directly into the foam core. I could have cut out an area on the back side to account for the flange, but it wasn't really needed in this case. 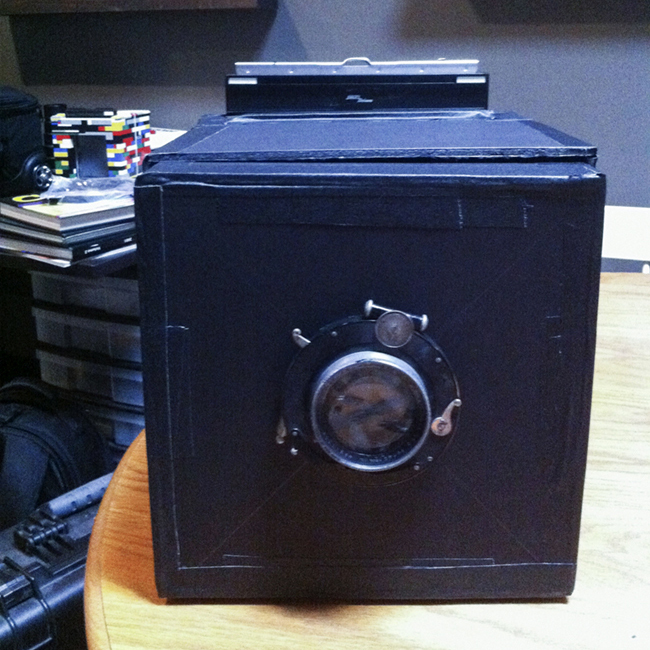 "Done" camera, sans ground glass insert. 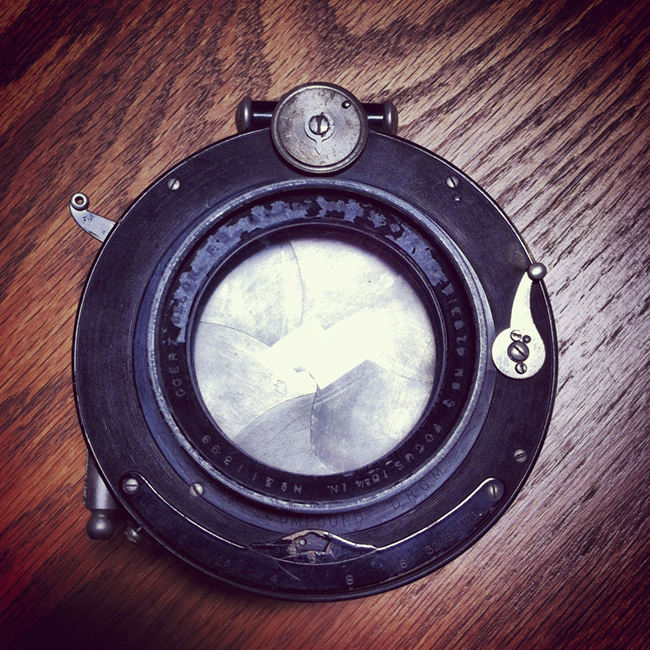 I held in the bobo ground glass from the Legotron to verify that the lens did what it was supposed to. 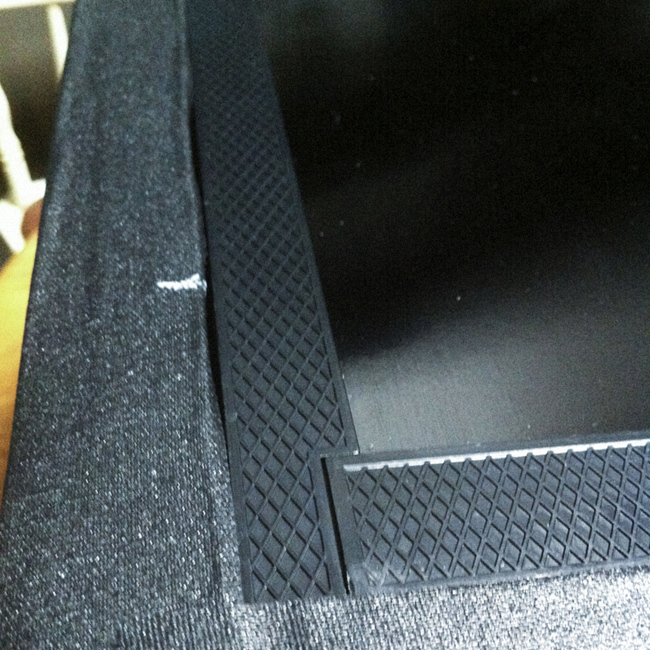 -3 ply of foam core cut to the same size as the a film holder. -Two layers with a fully cut out window for viewing. 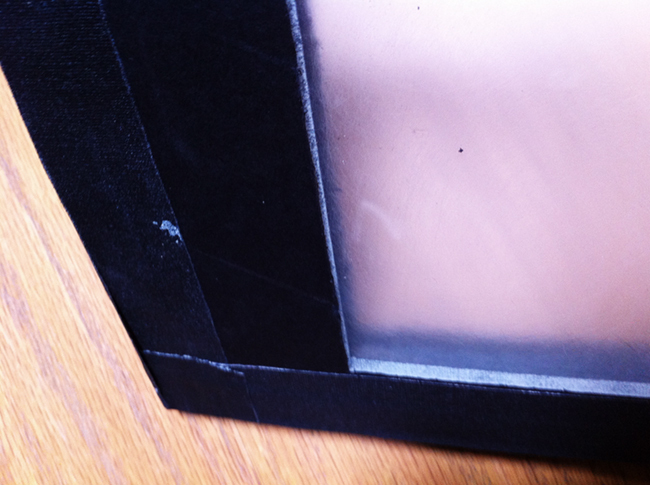 If the ground glass is 7x8", make these windows are roughly 1/4" smaller than that, to help secure the glass. 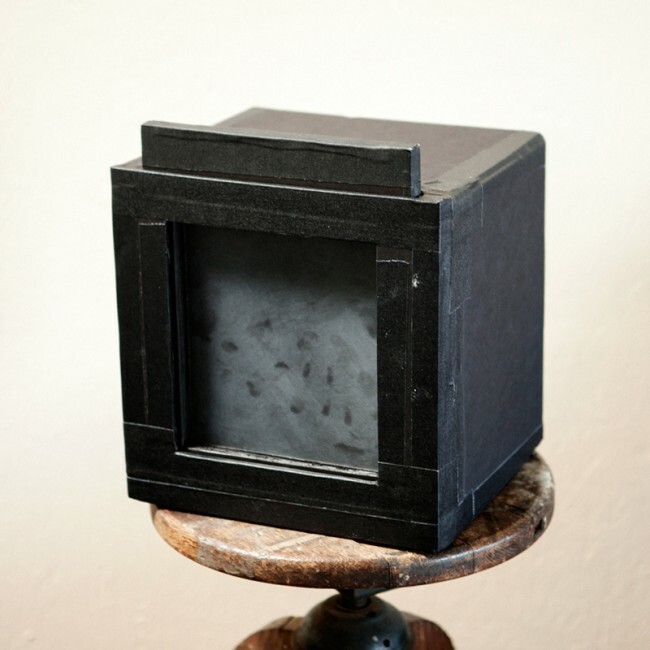 -The inner most layer has window cut to the exact size of the ground glass, but only cut through one layer of paper and the foam. That's leaving a single layer of paper to help secure the glass on the front side. That is then reinforced with Gaff tape. See photos below for a visual. Also, I put the ground glass side toward the middle of the insert (ie slick side toward the lens) to try to approximate where the film would be in the holder. I'm sure there's a more precise way to do this, but for throwing this thing together in a day, I wasn't super worried about it. Also, I thought about rigging the back area to accept the holder from top or from right, but then I realized I could just lay the camera on its side. It's not like the thing is going to break from being on its side, and its also a very easy fix. Ha. View from inside. 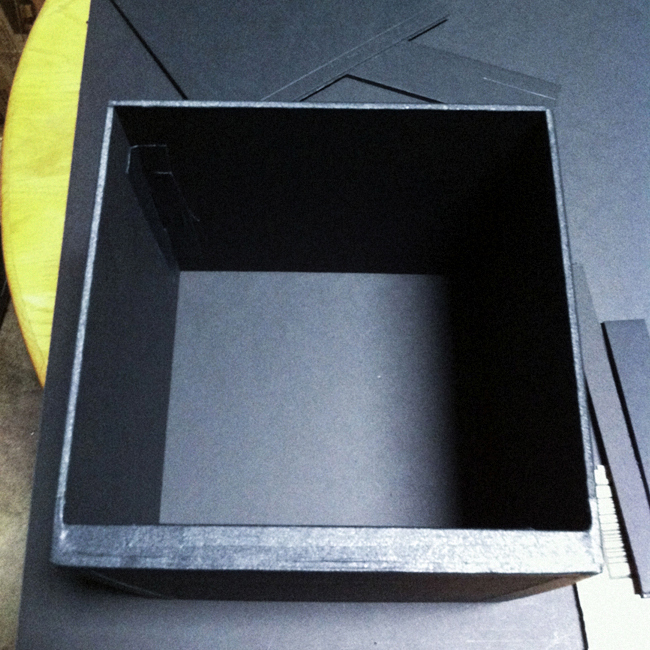 The light area you are seeing is the foam edge where the plexi is abutting it. 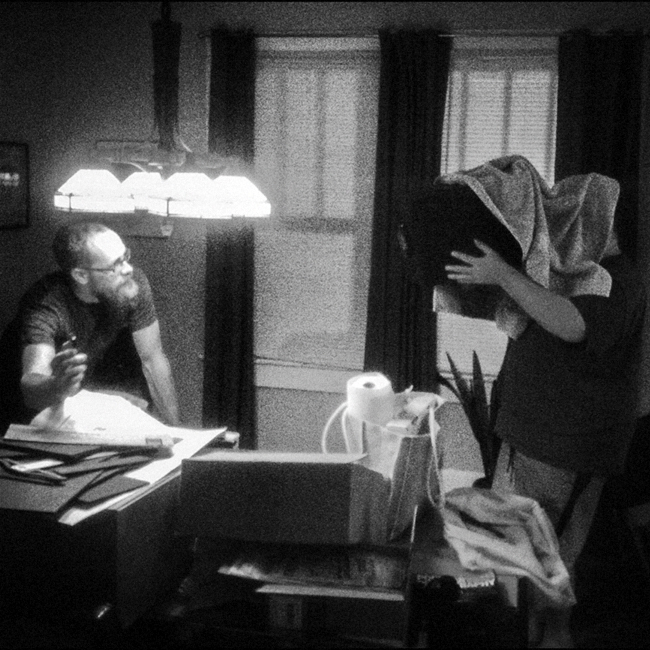 Here's Winslow helping me test the completed ground glass. Nice towel. 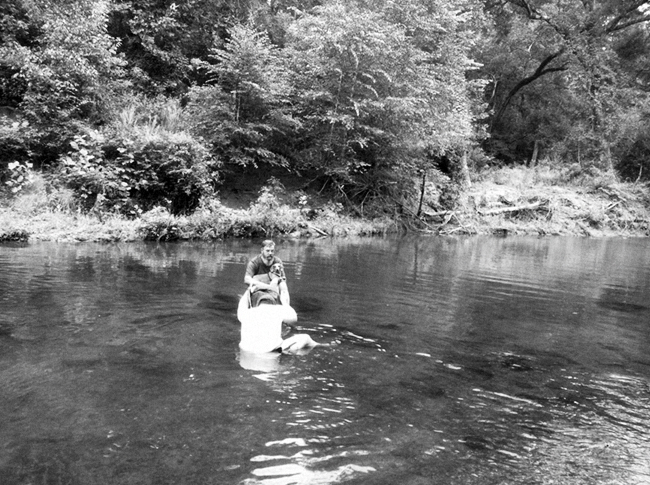 Here I am photographing William and Sadie in the Cahaba. The camera is still on a camping chair and I'm using my tshirt as a dark cloth. Serious business. And here are a couple more shots of the final product. Very fun and fully suggested build!